A letter was published this month in Nature Genetics by Gaugier et al. which has received notable attention. While many of us may be familiar with rare variants of genes that show strong association to autism, such as CNTNAP2 or FMR1, this new study instead focused on the possibility that common genetic variants, i.e., gene polymorphisms that occur in the general population, could affect autism risk via an additive effect. “[autism’s] narrow-sense heritability is ~52.4%, with most due to common variation, and rare de novo mutations contribute substantially to individual liability, yet their contribution to variance in liability, 2.6%, is modest compared to that for heritable variation” (p. 1). Now, there’s a lot of Population Genetics terms in that statement so here’s the basic translation: Common point mutations, aka “SNPs,” may confer higher autism risk when additive. This appears to account for roughly 50% of potential genetic risk for autism. Meanwhile, even though rare de novo genetic variants confer considerable risk on a case by case basis, over all, they don’t account for the bulk of genetic risk in the larger autism population (2.6%). 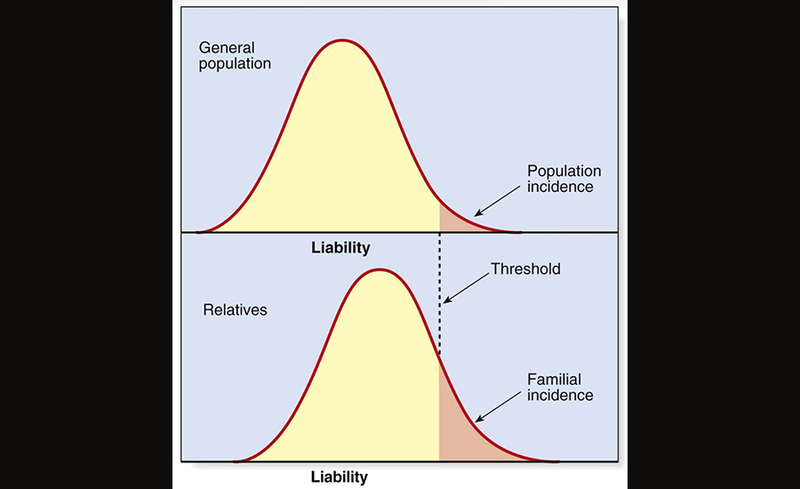 Liability in Population Genetics, image borrowed from here. Keep in mind that this is just a model which is attempting to estimate how much common genetic variants could affect autism risk. 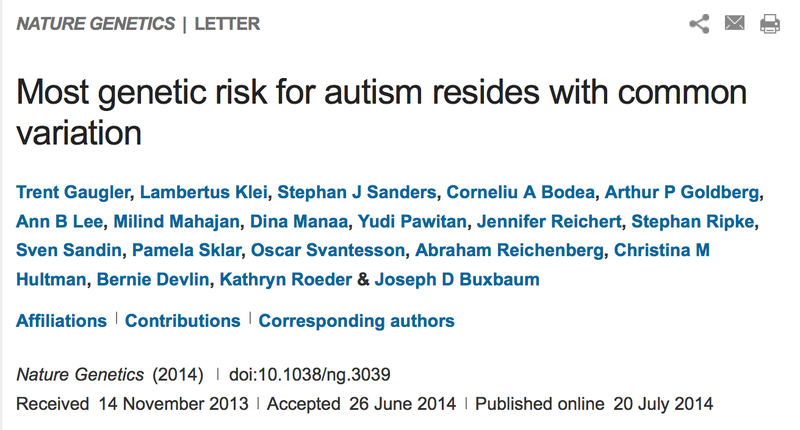 Also keep in mind that they may confer “risk” and do not necessarily “cause” autism. Even rare variants which confer considerable liability are not always associated with autism. Many of the syndromic forms of autism are good examples of this, and while they may more frequently show autism symptomotology, it is a rare genetic syndrome that approaches 100% autism comorbidity. Right now I’m working on a publication involving a core set of rare genetic variants in autism, studying functional overlap. So when I read this article, I was naturally curious to find out whether some common genetic variants had already been identified, as the authors never made mention of this. So I wrote to Dr. Kathryn Roeder, one of the corresponding authors for the piece, asking exactly this. In a very kind fashion, she responded to my inquiry, stating that there were few, if any, studies addressing this issue, primarily due to such low power. (In order to study common genetic variants, usually very large numbers of individuals are needed in order to supply adequate statistical power, which can be a real challenge in the research of specific conditions like autism.) But she also said she was hopeful that this would start to change in future. I’m likewise very hopeful for the same, especially with the little nudge in interest given by their recent study. I will be chomping at the bit to find out if the functions of common variants overlap those of rare ones. Only time will tell! Very few GWAS have reported the general population prevalence for common variants associated with autism risk. Tens or even hundreds of thousands of people may be required to identify the actual population prevalence of common genetic variations. The rs1858830 C variant in the promoter region of the MET gene on chromosome 7q31 has been the most replicated common gene variation associated with autism. 47% of the general population has this common genetic variation. The MET promoter variant rs1858830 allele “C”, is found at increased rates in autism, is associated with neuronal growth and development, but also is involved in immune function and gastrointestinal repair making the strength of this common genetic variation risk about the same as the genetic risk for autism as the possession of a ‘Y’ chromosome. Thanks for the info, Robert. A few of those are present within the core set I’m currently working with (MET, COMT, GST) and am familiar with others (MTHFR). One of the interesting things that has been found is that pathways which one might consider more related to everyday cellular “housekeeping” (e.g., oxidative) and not strictly “neuronal” can nevertheless disturb the outcome of neuronal development, potentially leading to similar outcomes as other mutation models that have more obvious ties to neuron maturation. My, this is such sophism! I mean, autism is such a generic descriptor, anyway, but to say there’s genes for autism is akin to saying there’s genes for being run over by a car. Maybe you walked a bit slow, maybe your ears were a bit blocked but there were NOT genes for being crushed by a moving tonne of metal. On some level, autism is a very generic descriptor, you’re very right. When one considers the huge variety of genes alone (not to decry other variables) which can sway risk towards autism (again, rarely a certainty), the range is astounding. However, I think autism does still share a commonality, not just at the vague behavioral level, but also in brain structure and function, to a certain degree. I also suspect that these characteristics lie on a spectrum of severity, blending into normality. And I think autism and many forms of mental retardation (which share more links etiologically than we like to admit) may be tightly linked with human brain evolution and “intelligence”. That’s not to say that “Autism is awesome because some of them are geniuses and it’s the next stage of human evolution!” No, although many adult autistics have professed this belief. No, I suspect that the evolution of human intelligence, which has had effects on many genes and been subject to many environmental effectors, has led to a vulnerability to conditions like autism and MR. I think that’s particularly evident at the genetic level, because, like a book, genetics are easier to read than the complex environment that surrounds them. Overall, I do understand some of your frustrations. However, because we have yet to adequately understand and predict the complex interplay between genes and everything else, that doesn’t mean that the study of them is unworthy or unhelpful. No, that fog hasn’t lifted yet. And it probably won’t for some time. But that requires patience and persistence. We can’t have all the answers now. Some are still percolating. I have been working on this for some time and in a few months may have something worth publishing. One of the first so-called ‘autism’ genes discovered are polymorphisms in the serotonin transporter gene. The human serotonin transporter gene is located on the long arm of chromosome 17 (17q11.2) and encodes for the serotonin transporter that is involved in the communication between neurons. In the human population, the frequency of the long allele (LL) of 5-HTT is approximately 57%, while that of the short allele is 43% (Danielle et al 2011). The short allele is the most referenced polymorphism that has been described as an ‘autism’ gene. The problem with autism researchers is that they are only looking at patients with autism and draw a false conclusion. The polymorphisms in the serotonin gene can be more robustly described as a polymorphism associated with increased rates of autistic traits or the broad autism phenotype, not strictly diagnosed autism. The SS serotonin transporter gene, SLC6A4, has been associated with social and nonsocial phenotypes typically described in broad autism phenotype symptom array including high rates of autistic personality traits, depression, obsessive compulsive traits, rigid behavioral traits, irritable bowel syndrome and eating disorders.